Drakemall is running another gaming giveaway to gift one of their fans with a brand new gaming console! 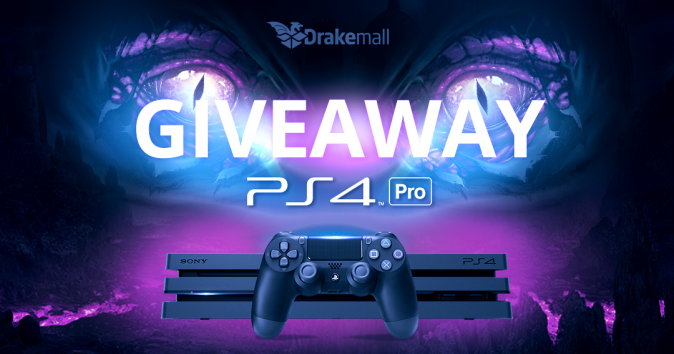 To enter in their latest Drakemall PlayStation 4 Pro Console Giveaway grab your free entries by following few simple steps listed down below! If you own a 4K TV, get ready for higher quality visuals, including resolutions of up to 4K. No 4K TV? You can still enjoy gameplay and frame rate enhancements on your standard HD TV with PS4 Pro. PS4 Pro packs more than double the GPU power of a standard console and a beefed-up CPU to give you an incredible combination of graphical prowess and processing muscle. Watch video streaming services in amazing 4K. Check out the Netflix app which allows you to stream 4K movies and shows. There’s also a 4K compatible YouTube app coming soon to PS4 Pro. Games and entertainment streaming services can output up to 2160p; PS4 Pro upscales lower resolutions to 2160p. HDR not supported by all games and entertainment streaming services. 4K/HDR TV required for 4K and HDR. Bonus entries: Share your referral link with friends to get an additional 150 entries for each person who enters through the link. Not known how a winner is going to be contacted, probably by email shortly after giveaway ends and announced in the giveaway widget.